Vegetarian Dim Sum House (aka Veggie Dim Sum) is a no frills joint that looks a little sketchy from the outside but has a great reputation for vegan dim sum. 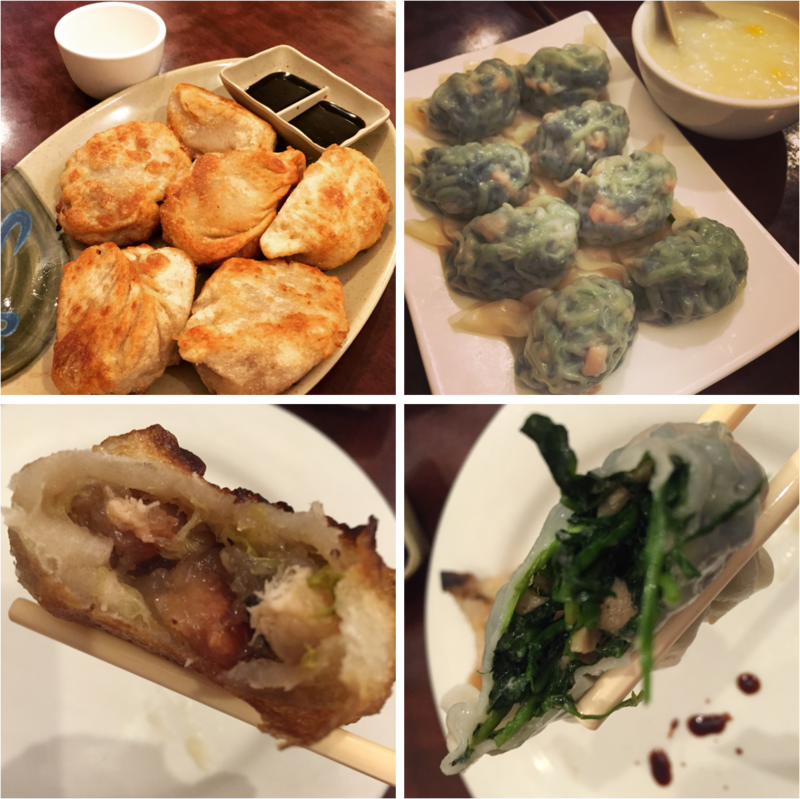 I had been going there for several years, but about a year before I started this blog I felt like Veggie Dim Sum had fallen of its game some and I haven’t been back for a while. After my recent outing there, I am very happy to report that they are back at full strength. Veggie Dim Sum doesn’t serve the food from carts pushed around the restaurant like in larger dim sum places, rather you order from a waitress by checking boxes on a menu card listing the dim sum items. They also have a full menu of Chinese dishes that use really convincing meat substitutes – the “pork’ products are the best realized of the fake meats. From among the non-dumpling choices I highly recommend the Fried Rice with Ginger and Ham and the Congee with Corn. The Dumplings: Veggie Dim Sum offers a decent range of dumplings, some of which, like the Pea Shoot Dumplings, are only available seasonally. For this outing we tried the Fried Dumplings and Steamed Watercress Dumplings, but I would also highly recommend the Steamed Roast Pork Buns. The Fried Dumplings are large “mouse style” pleated dumplings filled with roasted “pork” and mushrooms. It looked like the dumplings were pressed or flattened as they were fried, so they were fairly misshapen by the time they were served. The roasted “pork” filling was quite convincing and tasty, but the dough wrappers were really thick and the filling was overwhelmed by the volume of the dough. It is better to conceptualize these dumplings as a crispy fried dough with some roast pork and mushrooms on the side. The Steamed Watercress Dumplings were packed with watercress with a little bit of mushroom mixed in and were really tasty. The wrappers were thin and supple, but strong enough to contain the filling while being picked up with chop sticks. A plate of six of these dumplings is equivalent to a entire plate of green vegetables. The Dipping Sauce: Each of the dumpling orders came with a bifurcated bowl with two pools of soy sauce and on each table there is a bottle of soy sauce, a tub of sambal chili paste and a squeeze bottle of Chinese mustard. This leaves lots of room for saucier creativity on the part of the diner. 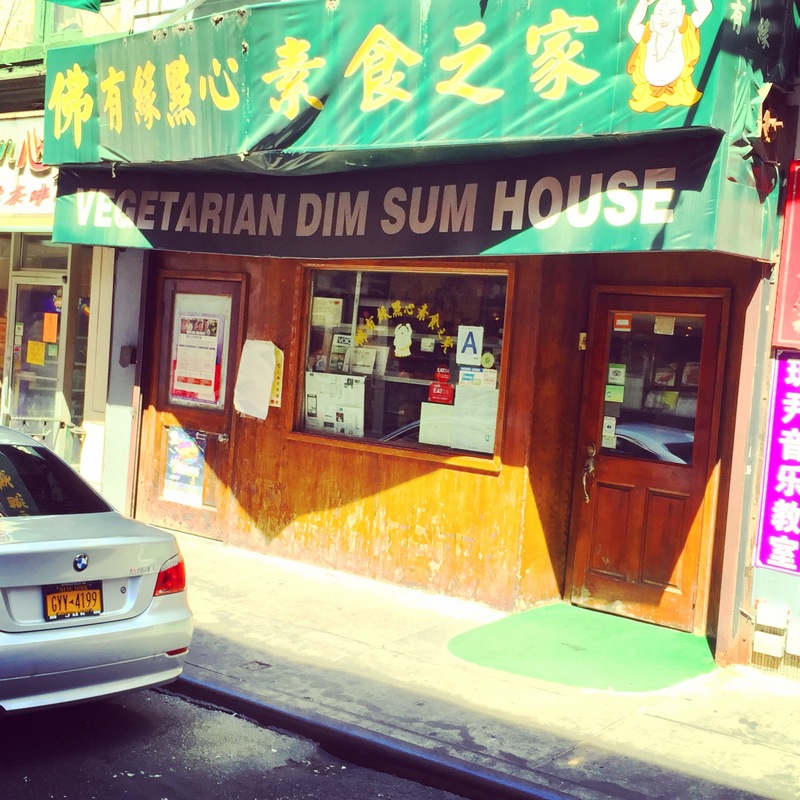 The Location: Veggie Dim Sum House is on Pell Street in Manhattan’s Chinatown. Pell Street is two blocks long and runs from Mott Street to Bowery and is also home to Joe’s Shanghai. This entry was posted in New York City, Pan Fried, Vegan, Vegetarian. Bookmark the permalink.